When I was in my 20s and working in a spirit-numbing job in Victoria, I and a group of coworkers met downtown one bright summer’s day to consult a psychic who was taking appointments from a large, unfurnished conference room up two narrow flights of stairs in the Huntingdon Manor Hotel in the Inner Harbour. As each of our names was called, we filed up to see him while the rest of the group sipped lemonade under umbrellas amid a flock of tourists on the hotel lawn. Jordan, the psychic, was barely out of high school. Far too young to be dispensing advice. Yet everything he said to me when my turn came was profoundly wise, and has stayed with me for more than 30 years. You know how tightrope walkers practice with a net? That’s what you need to do: Learn to walk like there is no net, but trust that the net is always there. Over time I learned that what he was talking about was Ayn Rand’s theory of a benevolent universe. Simply put, the universe supports our efforts in life. The moment one definitely commits oneself, then Providence moves too. All sorts of things occur to help one that would never otherwise have occurred. A whole stream of events issues from the decision, raising in one’s favour all manner of unforeseen incidents and meetings and material assistance, which no [one] could have dreamt would have come [their] way. 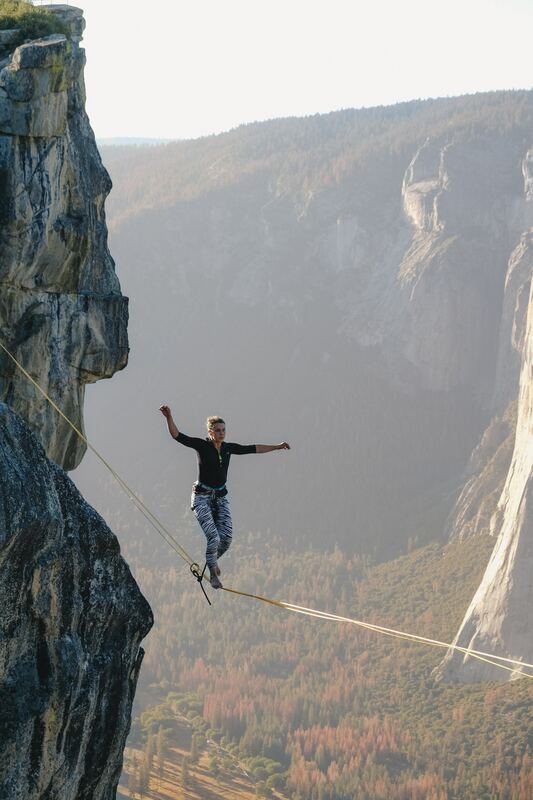 Tightrope walking as if there were no net takes practice. Did I fall? Hell yes, many times. But Jordan was right. Ayn Rand was right. The universe “caught” me every single one of those times. Start small. Quit the job that’s numbing your spirit and eating your heart in increments. Trust that what you really want to do—what makes you come alive—is what you’re supposed to be doing. Yes, and we usually have a picture of what will happen when we leap that turns out to be completely wrong. Sometimes I’ve leapt straight into total disaster – but it’s always the most transformative disaster – exactly what I needed but didn’t know it before I leapt. Love to you in your latest leap of faith. It’s inspiring to watch Danièle these days! Love to you both. Leap and the net will appear (John Burroughs). I’ve seen this play out in my life as well- and it all feels so effortless and surprising. I love this. Oh those frames of anxiety. Who makes them? Once in place, it’s hard to let them go.